This recipe, my lovely friends, is super for seafood lovers and aficionados! 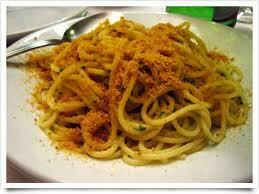 Bottarga and pasta merge in a great dish! But what is Bottarga? One of the great delicatessen coming from Sardinia and Sicily, meaning tuna or mullet roe, in origin used to make the bottarga sauce to top pasta. You can find the precious ingredient in any Italian deli shop in Britain. The pasta? You can use “linguine” or “spaghetti” and in general it is better a kind of “pasta lunga” like the one aforementioned. The ingredients are 400 g (14 oz) linguine or spaghetti, 70 ml (2 fl oz) extra virgin olive oil, 1 garlic clove, 120 g (4 oz) tuna roe, and parsley. How can you make it? Very, very easily. The sauce rules! Grate the cod roe, put the olive oil into the pan and heat it with some garlic. Sweat the garlic off until it turns golden, then remove it from the pan. Then, boil the linguine pasta and while it is boiling, you can proceed with the sauce preparation. Next, move the pan away from the heat and leave the oil to cool down for a minute or so. Then, add 2/3 of the grated cod roe into the pan and give it a good stir. Add a bit of the parsley into the pan and season with black pepper. Finally, add a couple of spoonfuls of the boiling water you are using to boil your pasta. Stir to make a creamy mix. When your sauce is ready, and when the pasta is cooked “al dente”, just before draining it, put the pan containing the sauce over the heat again. Drain the pasta, leaving it slightly wet. Add the pasta into the sauce pan and sprinkle with the remaining grated cod roe and the remaining parsley and stir well for a minute. You will serve the pasta “alla bottarga” with a nice glass of white wine. Don’t add Parmesan cheese! This entry was posted on Friday, July 22nd, 2011 at 2:25 pm	and is filed under Italian Recipes and Food. You can follow any responses to this entry through the RSS 2.0 feed. You can leave a response, or trackback from your own site.